Grelka is a Nord merchant who resides in Riften. She is the owner of one of the stalls in the center of town and will sell you weapons, apparel and various other miscellaneous items. She has a starting amount of 750 gold to barter with. She also offers expert training in Light Armor. According to the Official Game Guide, she is the sister of Solaf and Bolund in Falkreath. Grelka currently lives in Haelga's Bunkhouse. She starts off her day by waking up at 7am and has breakfast at the Bee and Barb for an hour. After that, she will work at her market stall at Riften Grand Plaza for a full twelve hours until 8pm. After selling items all day, she will return to the bunkhouse to have her dinner, and she has the rest of the evening free. At 1am, she goes to sleep for six hours and repeats her schedule the following day. She wears a set of leather armor, with matching pairs of bracers and boots, excluding the helmet. She carries a leveled dagger, the key to her market stall, and a selection of common items and gold. She seems neither a charitable or amicable person, evident in the things she says to everyone. For example, when Edda begs her for money, she will only give a "Go away." while Snilf will likewise receive "No. Now shove off." from her. While she runs her stall, she will try to advertise her goods, saying, "Looking to stay alive? Why take a chance? ", "Buy some armor and live to tell about it! ", or "Protect yourself right... buy armor from Grelka." She will notice if you approach, though her tone will sour: "You going to buy something or just here for training? Otherwise, move on. ", "You gonna stare all day or buy some armor? ", or "Come on, come on. The sooner you buy, the sooner I can get drunk." Seeing her outside her stall will net you the same surliness: "Can't you bother me at my armor stand in the market? Or are you that desperate for training?" When you end your conversation with her, she will tell you, "Come back when you're ready to spend more gold... goodness knows I could use it." When asked for Light Armor training, she will say, "I'll teach you how to use it effectively, and keep you quick on your feet." 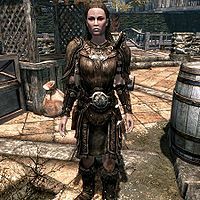 You can complain about the way she treats all her customers, though it will be in vain: "Look, I've moved all over Skyrim selling these bits of junk and I'm barely scraping by. I'm not out to win friends and I could care less if you're happy about your purchase or not. I just need the coin. The sooner I get out of Skyrim the better." You can then ask her why she'd want to leave Skyrim, and she'll respond, "Are you serious? The war is tearing the land apart, the dragons have returned seeking who knows what... Skyrim is going nowhere fast. If I were you, I'd pack up and get out of here before you end up in one of those burial cairns." If, on the other hand, you want to know more about the Ratway, Grelka will help you: "There are ruined sewer tunnels beneath the city. The only way I know how to get in there is through a door off of the canal. If I were you, I'd keep my feet dry and stay up here." You can also ask her about the Thieves Guild, and she will reply, "They'd stop at nothing to take your last bit of food if that's all you had. The Ratway's too good of a place for that scum." This is the merchandise found in Grelka's merchant chest. These items are only available if purchased from the merchant; they cannot be pickpocketed or stolen. They are restocked every two days. Bolli: "Grelka, I wanted to talk about that suit of leather armor you sold me. The fasteners are already coming loose." Grelka: "Fine. It'll be five septims to repair it." Bolli: "Why should I pay for a repair on something I just bought?" Grelka: "All right, all right. Just bring it to me tomorrow and I'll fix it for you." Mjoll: "Aerin tells me you might be dealing arms to the Thieves Guild. Is this true?" Grelka: "I don't know what he's talking about. He must be seeing things." Mjoll: "I'm watching you, Grelka. One slip up and I report you to the guards. You got that?" Maven: "Grelka, how fast can you get your hands on some longbows?" Grelka: "I don't usually deal in weapons, but I know someone who can get them for me. You mind paying a little extra to get them fast?" Maven: "I don't care what it costs. I need four longbows and four score of arrows. Just make it happen." Grelka: "I'll contact my man tonight and let you know what he says." Drifa: "Grelka, have you had anyone come by and try to sell you an iron war axe?" Drifa: "Well, we had one go missing from the Pawned Prawn, and I was just wondering..."
Grelka: "Oh I get it. 'It's missing so Grelka must have it.' I wish this town would stop pointing their fingers at me. There is a Thieves Guild in town you know." Grelka: "What's so good about it? I've got deadbeats who don't pay me, the city guard looking over my shoulder and Maven Black-Briar breathing down my neck." Dinya: "You poor thing. You should come by the temple, speak to Maramal." Grelka: "Religion isn't going to save me. So unless Mara is going to start raining coin from the heavens, why don't you mind your own business." Grelka: "Oh, Haelga... there you are. Your special order from Hammerfell came in off the last Khajiit caravan." Haelga: "Oh, good. I wanted to try that out as soon as possible." Grelka: "Try it out? What would you need a leather harness for anyway?" Haelga: "It's a religious thing." Grelka: "So, Brand-Shei... business as awful for you as it is for all of us?" Brand-Shei: "Worse. The Khajiit Caravans are the only way to get supplies into the city, and even those are becoming more infrequent." Grelka: "Well, let's all raise a flagon to Ulfric; future King of Skyrim and bringer of poverty to the working class!" Brand-Shei: "Grelka! Lower your voice before you get us both in trouble." There is an unobtainable item called Package for Grelka, internally labeled SSDPackageFromDarkwater. Odfel: "Grelka, do you fancy a walk tomorrow?" Grelka: "Odfel, I've told you time and time again. I'm not interested in a relationship with you." Grelka: "I need someone that cares about me more than they care about themselves. That person isn't you." Filnjar: "How are your parents faring, Grelka? Doing better than we are I would guess." Grelka: "It's no feast in their neck of the woods either. Last time I was up there, father said they were barely scraping by." Grelka: "That's what scares me. I'm afraid I'll travel to Darkwater Crossing and find it burned to the ground." Grogmar: "I've been watching the way you mine and I have to say, I'm very impressed." Grelka: "I owe it all to my father who started me swinging the pickaxe when I was a barefoot little girl." Grogmar: "Well, it shows. Your skill rivals some of the greatest miners I've known." Grelka: "Thank you. It's nice to know someone admires me for more than just my appearance." Grelka is supposed to be available to you as a potential spouse, but the dialogue option never appears, as there are no quests associated with her to raise her disposition. This issue has been addressed by version 2.1.3 of the Unofficial Skyrim Patch; you can invest in her, which raises her disposition. This change has been reverted by version 3.0.1 of the Unofficial Skyrim Legendary Edition Patch; upon further consideration she does not meet the developer's definition of a shopkeeper. Open the console and target Grelka. Type setrelationshiprank player 4, and then speak to her with an amulet of Mara equipped. Esta página foi modificada pela última vez à(s) 05h16min de 11 de fevereiro de 2016.